ALABAMA CHIEF JUSTICE Roy Moore’s defiance of federal court rulings on gay marriage violated judicial ethics, a disciplinary court ruled today, before suspending him for the rest of his term. Moore was found to have encouraged probate judges to deny marriage licenses to gay couples six months after the US Supreme Court ruled that everyone has a fundamental right to marry in all 50 states. This time, Moore sent an administrative order to the state’s 68 probate judges, maintaining that the Alabama Supreme Court’s gay marriage ban remained in “full force and effect” despite the ruling from the nation’s highest court. 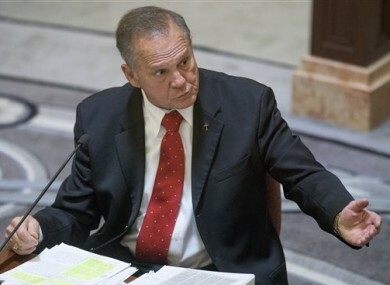 Moore (69) had already been suspended from the bench since May, when the state’s Judicial Inquiry Commission accused him of violating judicial ethics. By the end of his term in 2019, he’ll be beyond the age limit of 70 for judges, unless voters raise the limit in November. Moore was loudly applauded when he entered the ornate chamber where he usually presides over the state Supreme Court. He told his inquisitors that the ethics charges were “ridiculous”. Moore’s ethics trial came amid upheaval in all three branches of Alabama’s government. The Republican speaker of the state House of Representatives was removed from office this summer for criminal ethics violations. A legislative committee is weighing whether Governor Robert Bentley should be impeached over a scandal involving a top aide. Email “Alabama Chief Justice suspended over gay marriage order”. Feedback on “Alabama Chief Justice suspended over gay marriage order”.